GERMANY: Two German offshore wind farms achieved financial close in February days ahead of government proposals to reduce support for renewables. 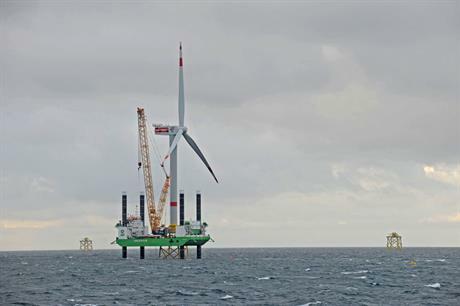 Developer WPD Offshore announced that equity and debt financing totalling EUR 1.3 billion has been agreed for the 288MW Butendiek offshore wind farm in the German North Sea. Construction will begin in spring next year, with operations scheduled to start in June 2015. More than EUR 850 million in loans will fund Butendiek's construction and initial operation. It is being provided by a syndicate of commercial banks led by KfW IPEX-Bank, UniCredit and Bremer Landesbank with additional support from the European Investment Bank (EIB), Danish export credit agency EKF and German development bank KfW. Ownership of Butendiek is now shared between five organisations: WPD Offshore (10%), green energy investor the Marguerite Fund (22.5%), Siemens Financial Services (22.5%) and two Danish pension funds, Industriens Pensionsforsikring (22.5%) and Pensionskassernes Administration (22.5%). Meanwhile, German utility EnBW has signed a EUR 500 million loan agreement with the EIB for the 288MW Baltic 2 offshore wind project in the German Baltic Sea. However, days after the deals were struck, Germany's federal economy and environment ministries proposed a reduction in government support for renewables. They want all renewable plants commissioned from 1 August to only be eligible for the market value of the electricity they generate in the first five months after commissioning. This is around EUR 0.0426/kWh at present - 20% of the current feed-in tariff rate for offshore wind of EUR0.19/kWh paid for eight years. This move would alter the economic basis for all offshore wind projects in development and would have wide-reaching consequences for existing loan arrangements, warned Germany's wind energy association BWE.